PiÃƒÂ±on wood is traditionally burned in the Southwest on wintry nights. The resulting smoke wafting through the air is sweet, spicy, deeply resinous. Our version of piÃƒÂ±on wood is a blend of cedarwood, patchouli, oranges, musk, sandalwood, amber, cinnamon and clove. 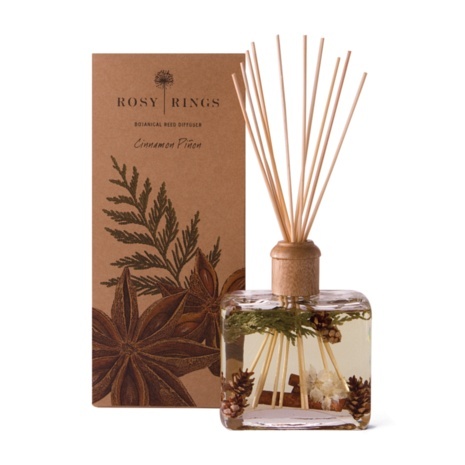 For lovers of campfires, wood smoke and autumn leaves ablaze, this is the scent for you. Made with: cedar, cinnamon sticks, larkspur flowers, omorica cones, essential and high quality fragrance oils.Each 13 oz. bottle comes with a decorative wooden cap and 10 reeds. The fragrance will last 6-9 months.